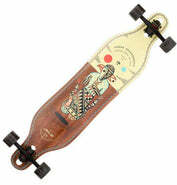 Longboard For Cruising | FREE UK Delivery on all Completes! If you're looking for a board to cruise about on, and you want maximum comfort over distance, we'd recommend that you go for a full-sized longboard rather than a mini-cruiser or a retro cruiser for most adults and teenagers. Longboards are bigger and heavier, sure... but they have a lot more room to stand on, generally more flex to them and bigger wheels when compared to a smaller cruiser board. Add all these things together and you have a board that's easier to skate, more stable and forgiving, better over rougher surfaces (like most UK pavements and roads! ), and more comfortable if you're planning on skating more than five minutes. If smaller size is important to you, for example if you want to stash your board easily in a locker, then check out our range of skateboard cruisers and retro boards. 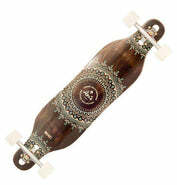 Little rippers would be better off on a Mini Cruiser. For cruising around, you want something with decent sized wheels - at least 65mm - to help you deal with the rough pavements you will inevitably encounter. 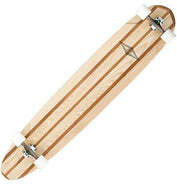 A flexy deck will take the sting out of anything you do roll over, and turny trucks are a must as wheelbases get longer. For more info, check out our Longboard Buyer's Guide, or give us a call and we'll be happy to take you through the options! 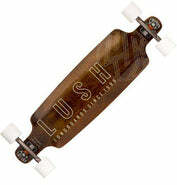 Products in the Longboards For Cruising collection have an average rating of 5 with 31 reviews across 7 products. The highest product rating is 5 and the lowest product rating is 5.